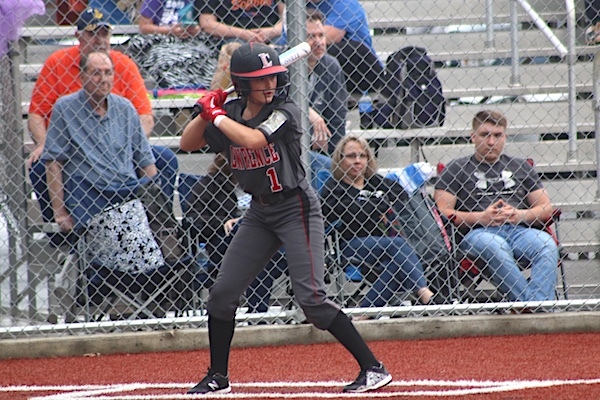 Pikeville, Ky — Amber Triplett singled up the middle to score Halli Caudill from third base and Lawrence Co. ( 12-3 ) won a wild 13-12 softball game over Letcher Co. Central ( 3-7 ) in the first game of the 17th Annual Lyndel Potter Memorial Tournament Friday at Pikeville High School. Halli Caudill was a terror on the base paths in a win over Letcher Co. Central. 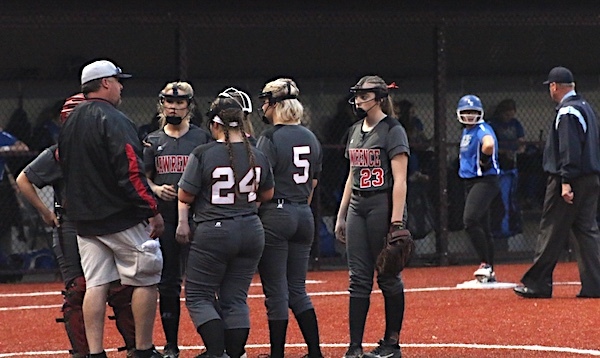 Mackenzie Methax went 4-4 and scored 2 runs, Caudill finished with 2 hits, 4 stolen bases and scored three times, Lillian Kinser had 2 hits and 1 RBI, Ashley Hayes 1 hit and 1 RBI, Kassidy Cavins singled and scored 1 run, Kensley Feltner had 1 hit and scored 2 runs, Abby Fletcher scored a run. Alli Triplett threw all six innings and struck out seven batters. She also scored 2 runs. Head Coach Kenny Horn talking to his infield during a key situation. Kassidy Cavins hit a walk off grand slam as the Lady Dawgs remained undefeated in 58th District action at Home. Abby Fletcher hit a three run shot and Halli Caudill homered as well in the mercy shortened victory. The Lady Bulldogs will return to action on Saturday when they play host Pikeville at 10:00 AM and Tates Creek at 1:00 to finish out pool play in the Lyndel Potter Memorial Tournament.